Don’t know what to do with left over meat loaf? Want an alternative to traditional meatloaf? Then I have the thing for you. 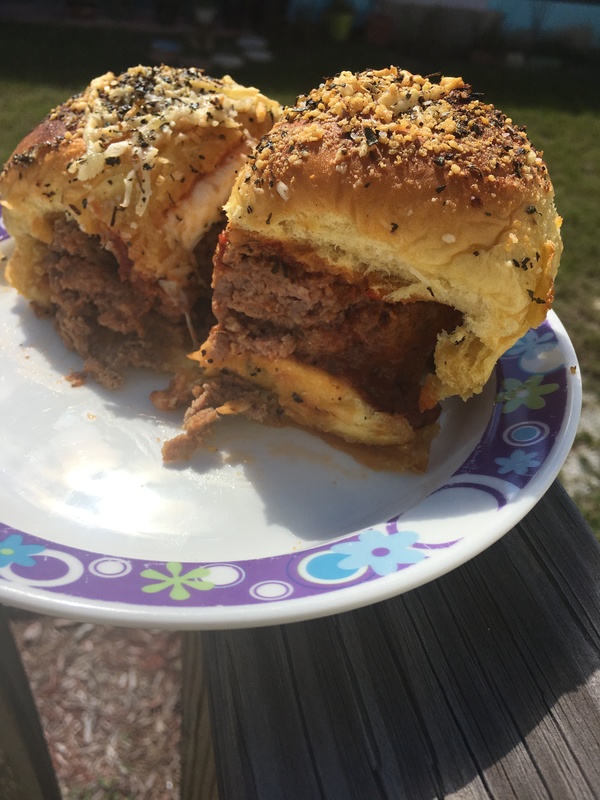 Meatloaf sliders. Perfect for grabbing lunch on the go, for the kids or for your Super Bowl Party. It is pretty easy to make too. Make your regular meatloaf and put in the fridge overnight. Put your roll bottoms on a cooking sheet or cake pan, I used Hawaiian Rolls but you can use larger ones. Place meatloaf slices on rolls. Cut slices of mozzarella and put on top of the meatloaf and then put the roll tops on. I painted the roll tops with garlic butter but that is up to you. Sprinkle with shredded Parmesan cheese. Place sliders in oven and broil on high for 2 minutes.